Win this app January 10th, 2015! Fraction Mash is an innovative tool that teaches fractions! Kids can use their own photos to dice, slice, and divide them into works of art. When making the photo mashups, you will see the grids, and fractions below. There are so many innovative ways to use this app. The developer is the New York Hall of Science. They have focused on creating tools that help to enrich and support STEM learning. The creative approaches to learning science and math and engineering are pretty impressive. 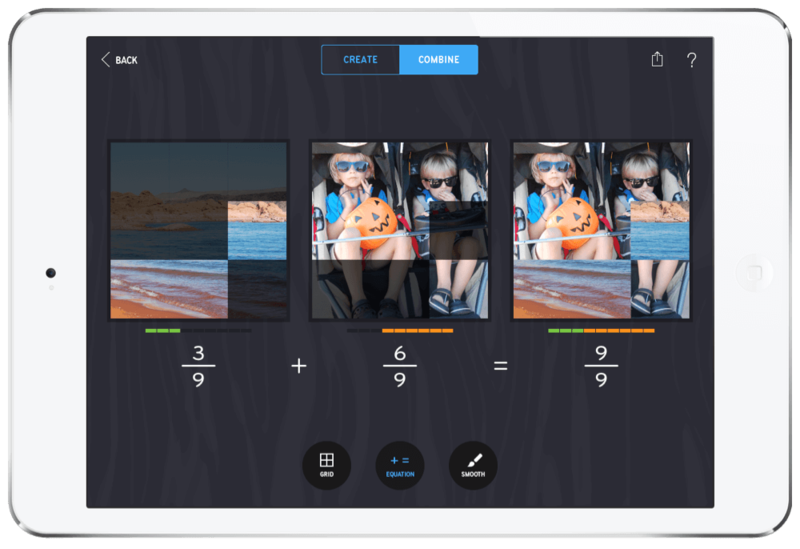 Fraction Mash is one of 5 apps that work together as a suite called “Noticing Tools“. 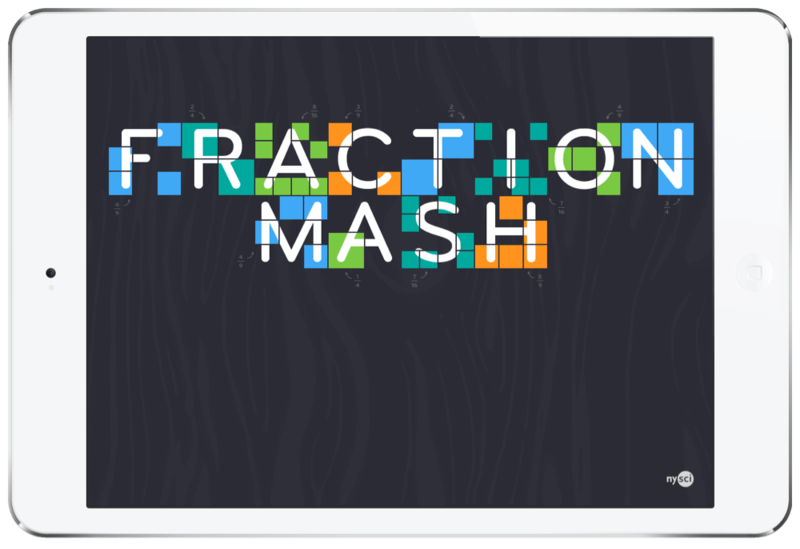 I would definitely recommend checking out the NYSCI website and watching the video clips on Fraction Mash to learn more.Teachers and tutors can also use this app in their classrooms to help children better understand and relate fractions to everyday life. My first impression when opening the app was that it was unique and fun for kids. The app design is simple and clean. I have never seen anything like it as far as the concept. The features might take a little exploring but overall, it is very easy to understand. My kids and I first explored the mash ups. We had a lot of fun mixing and dividing the photos. The combinations were more fun when we uploaded people and played with faces. There is a free starter pack of photos available if you don’t have any of your own. One of our favorite tools was the smooth tool. It gives the mashed up picture a smoother look without the lines between photos. While you are dividing and blending the two photos together, it is easy to watch and see the fractions and math being input below. It really breaks down fractions well and helps apply them to something fun and silly. I then explored the “Intro to Fraction Mash” section so I could understand everything the app had to offer and how to use it. You will be able to swipe through simple and brief explanations as you go into this section. They will discuss what the app is about, the important tools you can use, and how to make a fraction mashup report in the “tell the story” section. It also goes over privacy settings and the online resources available for teachers. In some ways, I liked the simple explanations but I do wish a better overview was available in the app for how to better use the fraction tools and how to thoroughly write a fraction mashup report. Last, I checked out the “Tell the Story” section. This is a creative and fun idea because the student can take what they have learned from their own photo mashup and explain how it applies to math, and fractions. The student can use this in a classroom report and show a teacher. Teachers can also use this app in the classroom and divide the class into groups to explore the app. There are many online resources available as well through the Fraction Mash app for teachers. I would recommend this app to children ages 8 and up. It will definitely help children understand numerators and denominators better. It blends learning and fun perfectly. I love the idea of mixing art and creativity to teach fractions. Math is often stereo typed as stringent. Kids can struggle with to understand how it might apply to them creatively or in other subjects. This is a great tool to show that. I loved the simple and clear design of the app but I would love to see more thorough instructions on ways to use it in the classroom or at home. Be sure to enter the giveaway found on the Touch Autism Facebook page this week for Fraction Mash. To learn more, check out the Fraction Mash website. to discover a company that is dedicated to developing apps that serve as a creative platform for irresistible STEM learning. Buy the Fraction Mash App in the App Store today! Fraction Mash is an innovative and creative app that teaches fractions! Kids can use their own photos to dice, slice, and divide them into works of art. 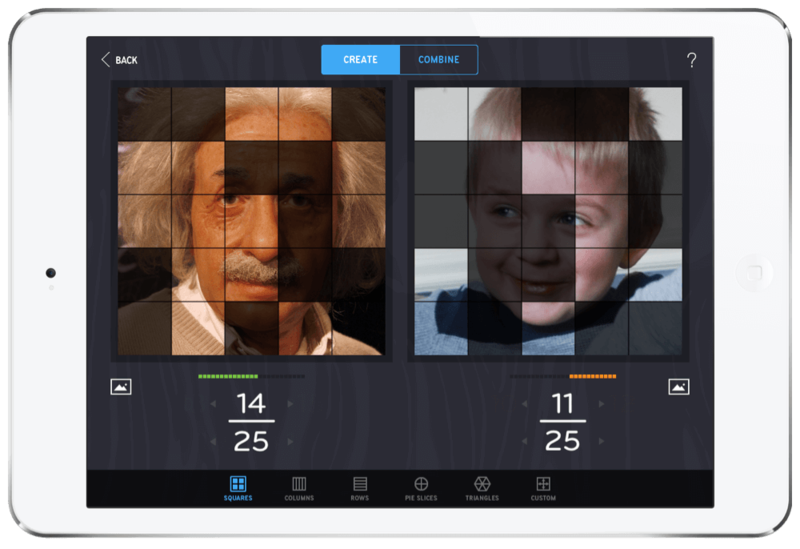 This clever math and learning app is definitely worth checking out!